The Mora Robust Knife has an impact-resistant handle with a larger geometry that fits even better in your hand. The finger guard has been developed to optimize safety. The blade has a perfect balance between length and width, which gives a better experience when using the knife. The Robust Knife has an extra thick blade of carefully selected carbon steel with an extra impact-resistant handle. The Mora Basic 511 knives have an impact resistant handle with a new, larger, geometry that fits even better in your hand. The finger guard has been developed to optimize safety. The blades have a perfect balance between length and width, which gives a better experience when using the knives. The carefully chosen knife steel is also hardened in Mora, Sweden according to a secret recipe. CARING FOR YOUR MORA KNIFE: All non-stainless steel knives will rust in damp or corrosive environments. The acids in fruits or vegetables can cause a discoloration or patina on the blade. It is recommended to clean and/or wipe dry and then oil the blade after use. If using the blade around food, the blade can be wiped down with olive oil or coconut oil or whichever type of oil one prefers in the kitchen. Stainless steel blades do not require as much maintenance but can get spots etc. if the blade is not kept clean. Both types of blades can be washed with a mild soap and rinsed with water if necessary. Then dry and oil the knife after you are finished. 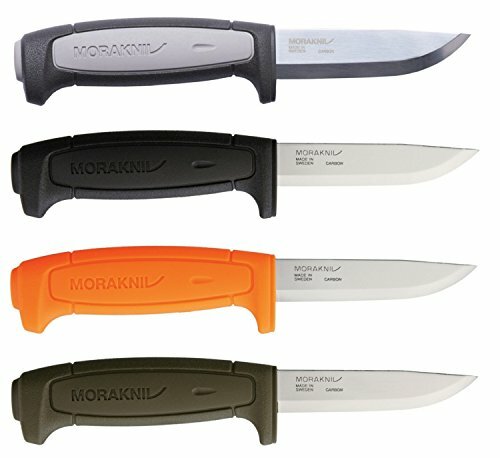 Morakniv does not recommend washing Mora knives in the dishwasher as the aggressive detergent can harm the blade. The Craft knives have a polished/buffed 0.08" thick blade with no spine grinding. This particular blade can be found on our Craft knives, where the sharp, durable edge and steady handle are high priorities, but the spine finish is not. Knives with this grinding are not compatible with fire starter, due to the rounded corners of the spine. Mora Craft Robust Carbon Steel Knife: Blade Thickness: 0.125 inches. Blade Length: 3.6 inches. Total Length: 8.11 inches. Weight: 4.9 ounces. Mora Craft 511 Carbon Steel Knife: Black Handle. Blade Thickness: 0.08 inches. Blade Length: 3.5 inches. Total Length: 8.125 inches. Weight: 2.8 ounces. Mora Craft 511 Carbon Steel Knife: Orange Handle. Blade Thickness: 0.08 inches. Blade Length: 3.5 inches. Total Length: 8.125 inches. Weight: 2.8 ounces. Mora Craft 511 Carbon Steel Knife: Military Green Handle. Blade Thickness: 0.08 inches. Blade Length: 3.5 inches. Total Length: 8.125 inches. Weight: 2.8 ounces. View More In Fixed-Blade Knives. If you have any questions about this product by Morakniv, contact us by completing and submitting the form below. If you are looking for a specif part number, please include it with your message.